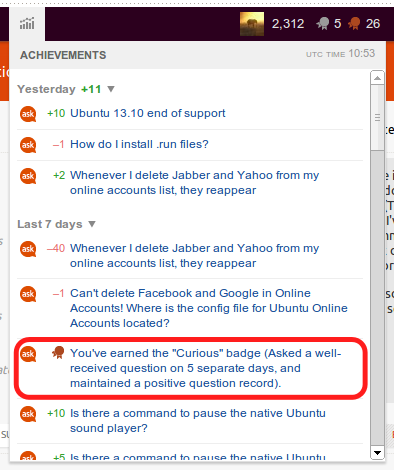 So in my notification list, I have "You have earned the Curious badge'. But I received the Benefactor badge yesterday and I didn't get a notification for it. Why is this? Is it not meant to or is it a bug? Not all badges will cause a notification to a veteran user such as yourself. We limit these to avoid "spamming" your notifications - the "Curious" badge is one that we deem to be "Veteran worthy", the "Benefactor" badge, not so much (after all, you already know you awarded a bounty).